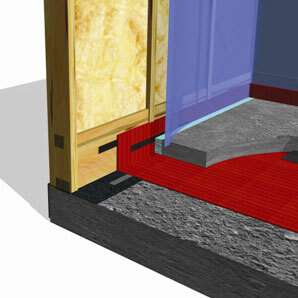 What is Damp Proof Courses? A damp-proof course (often abbreviated to DPC) is a horizontal barrier in a wall designed to resist moisture rising through the structure by capillary action. Why use a vapour control layer? Damp proofing in construction is a type of waterproofing applied to building foundation walls to prevent moisture from passing through the walls into interior spaces. In order to get water and gas tight connection it is important to recognize the fact that the accessories, as well as the installation process, play an equally important role as the DPC layer itself. When combining the different Monarflex accessories with the Monarflex barriers you ensure that a total protection system is formed that will assist the vapour control layer in providing the best air tightness. Monarfelx DPCs have an excellent anti slip on both side of the product to ensure the perfect joint between foundation and wall. The products are ageing resistant and further resistant to cement materials and common accruing alkaline.